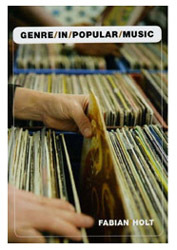 As Holt glosses it: “this is a book about the work of genre categories in American popular music” (p. 1). In part the book is a theorization of genre as a site of cultural practice, and in part a series of case studies. Holt’s own goals relative to the existing literature are to “bring genre scholarship closer to musical practice and experience,” and also to understand music genres “in the totality of social space” (p. 7). He adopts the term genre culture “as a concept for the overall identity of the cultural formations in which a genre is constituted” (p. 19). And given the complexity of social space, Holt feels that “the best way to [study genre] is not to develop an all-encompassing master theory, [but rather to] employ multiple critical models, explore plural narratives, and develop ‘small theories’ in relation to particular musical and social realities in a series of individually designed case studies” (pp. 7-8). Although existing studies of genre in popular music are not numerous, they have tended to be influential. This is in part because the concept of genre does so much cultural work. For example, as summarized by Holt, genre is a central concept underlying bourgeois aesthetics, structures of difference in signification, the creation and maintenance of social networks and individual identities, the negotiation of power and authority in social discourses, and the organization of industry, to name just a few. However, despite the many ways in which concepts of genre have been highlighted in particular studies, few extended theories of musical genre are currently available. Reflecting on this, Holt points out some of the reasons that it is difficult to create theories of genre in music, which include: the diverse sites of musical production, the ambiguous and polysemic nature of musical signification, and a strong suspiciousness regarding categories and categorization among many popular music scholars. Given such a scenario, Holt’s book is poised to make two contributions. One is the development of a theoretical toolkit as describe above, centered on the fluid and pragmatic concept of genre cultures. The second is to add further detailed case studies to the existing literature on genre. Although I will quibble with some details, on balance Holt succeeds enough on both fronts to make his work required reading not only for those interested in the problematic of genre, but also for those interested more generally in American music, the ethnography of popular music cultures, and the historiography of rock, country music, and jazz. In practice, the concept of genre cultures allows Holt to move fluidly through a wide range of historical and ethnographic topics. As preparation, chapter one is devoted to developing a general theory of genre, although Holt often proceeds by seeming to assume an intuitive or commonsense meaning for the term, allowing him to focus mostly on how genre functions as part of broader cultural frameworks. The lack of a definition for genre as such is not accidental: one of Holt’s key claims is that the complex cultural work associated with genre, along with the multiplicity of sites in which it is active, assure that genre is not a single or simple concept amenable to definition. Although Holt gives convincing reasons for adopting a fluid and pragmatic theoretical attitude, I can’t help feeling that he has more to say theoretically than he has allowed himself. The concept of genre cultures is enormously suggestive. However, at times the focus seems a little too broad, because Holt does not provide any detailed discussion of exactly how genre as a cultural category differs from other categories, especially closely related concepts such as style. The strength of his approach is that it shows in depth how genre concepts mesh with a wide range of cultural practices, but I find myself wishing for more discussion of their specificity. One result of this is that often the relevance of genre as a concept in the case studies is left implicit, rather than fully explored. This might not present a problem for attentive and generous readers, since in every case it is possible and enlightening to link up the specific historical and ethnographic details with general features of genre theory. But it would have been helpful if these links were more frequently spelled out. The case studies themselves are all useful, and the best ones are major contributions. Perhaps the most significant and original are his study of the relationship between jazz and rock in the early fusion era (chapter four), and an extended ethnography centered on Jeff Parker and the experimental jazz scene in Chicago (chapters five and six). Some might suggest that Holt’s ethnography could be a little thicker, but it is nonetheless effective in identifying core issues within the scope defined by the rest of the book. Interesting insights are also provided by Holt’s study of country music and the Nashville sound, which places special emphasis on the 1950s and how country musicians in Nashville responded to early rock’n’roll (chapter three). Here again, a critical reader might fault the degree of detail, but I don’t see this as a problem. Holt selects facts and interview materials which bear closely upon particular questions of genre, and at no time does he say anything which would throw his depth of overall knowledge into doubt. For the most part, the case studies are expert and just detailed enough to make their points, and those points are often incisive. It is also impressive how confidently Holt moves between various methodologies in the case studies (ethnographic, historical, and critical). The other two case studies excited me less: chapter two on roots music, Americana, and O Brother, Where Art Thou, and chapter seven, which presents a more wide-ranging meditation on the relationship between music and borders in U.S. history. This is not because there is anything particularly wrong with these chapters–they are just a little less original than Holt’s other case studies. In sum, Genre in Popular Music is an impressive contribution. If it leaves me wanting more in some respects, that is only because Holt is so successful with what he does present. The book succeeds in advancing the culturally informed genre analysis of authors such as Frith and Negus into new territory, and should be consulted by anyone interested in genre, or in popular music studies more generally.